Based on Hurricane Hunter reconnaissance reports, the 5 pm advisory put Hurricane Bertha's maximum winds at 90 mph; no significant short-term change is expected. A Tropical Storm Watch remains in effect for Bermuda. The Category 1 storm's forward speed is only 5 mph. It's headed north northwest from a position 270 miles southeast of Bermuda. A gradual northward turn is still expected, but weak steering currents could lead to considerable meandering in the coming days. A page A1 above-the-fold article in today's high-fiber edition of WaPo contains the startling news, "EPA Won't Act on Emissions This Year". How shocking that a Republic-con administration of oil executives would take no action on CO2! It took two staff reporters, plus two researchers, to figure this out? Where have you been the last eight years while this bunch of thugs has been giving the entire world the finger? The EPA is releasing an Advance Notice of Proposed Rulemaking at 1:30 today. 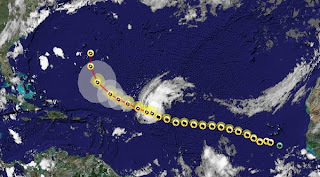 Hurricane Bertha remains a Category 1 storm today with maximum winds estimated at 85 mph. A Tropical Storm Watch has been issued for Bermuda. Bertha has slowed its forward speed to 6 mph, heading northwest from a position about 310 miles south southeast of Bermuda. The first reconnaissance flight is scheduled into the storm later today. "Goodbye from the world's biggest polluter". Moron. 5 pm Update: Hurricane Bertha remains at Category 1, with maximum winds down slightly to 85 mph. It continues to move northwest at 10 mph from a position about 425 miles southeast of Bermuda. Bermuda remains within the large cone of uncertainty. The Small Craft Warning for Bermuda has been extended through Saturday. The forecast calls for conditions to "become increasingly unsettled this weekend as Bertha approaches." After regaining Category 2 strength yesterday, Hurricane Bertha weakened back to Category 1 overnight. As of 11 am, maximum winds were 90 mph, and the storm was headed toward the northwest at 9 mph. It is now located a little less than 500 miles southeast of Bermuda, where a Small Craft Warning is in effect through Friday night. A gradual turn toward the north and slowdown in forward speed are still expected, but there is a great deal of uncertainty in the path and intensity, which could still strengthen in the next 24 hours. Hurricane Bertha has restrengthened this afternoon; it is now back up to Category 2 as of 5 pm, with max winds of 105 mph. Additional strengthening is expected, but with slow weakening after a couple of days. Movement is toward the northwest at 12 mph. A turn to the north is still forecast, but there is a large uncertainty in the future track. As usual, invest at your own risk. The WaPo article (cited below) on White House witness tampering is on page A1 of today's high-fiber edition. DotEarth has a post on the subject this morning: Cheney’s Office and the Course of Climate Policy. After weakening somewhat overnight, Hurricane Bertha is still a minimal Category 1 storm today with peak winds of 75 mph. Some increase in intensity is forecast in the short term, with weakening thereafter. The current track is toward the west northwest at 12 mph, but a gradual turn to a more northerly direction, along with a slowdown in forward speed, is expected. There is a great deal of ambiguity for both the path and the intensity, especially beyond 72 hours; the "cone of uncertainty" has evolved into a rather large circle. If you think our verbiage is harsh, get a load of the literally hundreds of virtual pitchforks being thrown by the electronic masses in the Comments section of the online version of the article. 11 pm Update: Bertha is still Category 1, maximum winds of 80 mph. A gradual turn to the north is expected, but the forecast path has shifted slightly to the west. Hurricane Bertha weakened further today and is now Category 1 with maximum winds of 85 mph. The storm is moving northwest at 12 mph, and a gradual turn to a more northerly direction is expected. As the storm weakens further, it should be a tropical storm as it moves southeast of Bermuda. Hurricane Bertha maintained Category 3 strength overnight, but weakened this morning to Category 2. At 11 am, maximum winds were 105 mph. More weakening is expected in the next 24 hours. The storm's track is now more toward the northwest, and the forecast has shifted the path further to the east of Bermuda. Update (11 pm):Hurricane Bertha has increased to maximum winds of 120 mph as of the latest advisory. It continues to move toward the west northwest at 12 mph, but a gradual turn toward the northwest and north is still expected. Correction (8:40 pm): The statistics on early season major hurricanes from the National Hurricane Center shown below apparently included only the Saffir-Simpson scale at landfall, so there were other occurrences, as well (for example, Emily became Category 3 on July 15, 2005). A more correct description of the list below would be: "All storms originating before August 1 which made landfall as Category 3 or higher since 1851." Clearly, that does not apply, at least yet, to the current case. As of 5 pm, Hurricane Bertha is now classified as a major hurricane, Category 3, with winds up to 115 mph. It is continuing toward the west northwest at a decreased speed of 12 mph. A gradual turn toward a more northerly track is expected. Some fluctuation in intensity is likely in the next couple of days. Except for Dennis in 2005, this is the first July Category 3 storm since Allen in 1980 and Celia in 1970, but these storms each formed originally on July 31. The previous earliest Category 3 or higher was Audrey in 1957. The reported price of $3.5 billion is considerably less than originally suggested. Jeff Zucker, president of NBC Universal, appeared in a 15-minute segment of CNBC's Squawk Box this morning to discuss the deal. CNBC's Media Money honey comments on the deal in her blog, with video: NBC And Why It's Paying $3.5 Billion For The Weather Channel. At 5 am this morning, Tropical Storm Bertha became the first Atlantic hurricane of the 2008 season. It continues to exceed strength expectations with maximum winds increasing to 90 mph as of 11 am. It could reach Category 2 today or tonight. The track remains west northwest, but the forward speed has lowered to 15 mph. Tropical Storm Bertha has strengthened today, with maximum winds now 60 mph. It continues to move west northwestward at a brisk pace, about 20 mph. The track should turn more northerly in the next couple of days, but there is still some disagreement among the models on the pace of that turn. Threats to land are still too early to determine, but the most likely target at this point, if any, would be Bermuda.